A March 2017 resolution “expressing the commitment of the House of Representatives to conservative environmental stewardship,” signed by 20 House Republicans. The Climate Leadership Council, which in Feb. 2017 issued “The Conservative Case for Carbon Dividends,” a policy brief signed by Republican senior statesmen George Shultz and James Baker, among others. The Niskanen Center, a libertarian think-tank headed by one-time climate denier Jerry Taylor that has become a beehive of thoughtful, analytical carbon tax advocacy rooted in free-market ideology. This page summarizes recent activity by these groups, which flies in the face of the climate science denialism that has become a hallmark of the Republican Party, prior to and during the Trump Administration.. It also compiles statements from conservative commentators and other right-leaning public personages supporting carbon taxing — often but not exclusively as a potential revenue source to reduce the U.S. budget deficit or to finance reductions in other taxes such as the Corporate Income Tax. Before we dive in, we have three survey articles to recommend. One is Ben Adler’s 2015 post in Grist dissecting three contrasting streams of thought on climate policy among so-called conservative policy intellectuals. Adler’s thumbnails of positions on climate policy and economics voiced by prominent conservatives including Ross Douthat, Charles Krauthammer, Reihan Salam, Greg Mankiw and 11 others make for a fascinating and informative read. Another is Ted Halstead’s Nov. 2015 Atlantic article, The Republican Solution for Climate Change. Subtitled “Republicans have the ability to offer a market-based solution to climate change, so why aren’t they doing it?,” the article is more an exploration of why the GOP should support carbon taxing than an explanation of why they don’t. Halstead founded the Climate Leadership Council a year later. The third is a penetrating March 2017 story in Yale Environment 360 (published at the college’s School of Forestry & Environmental Studies), Climate Converts: The Conservatives Who Are Switching Sides on Warming. 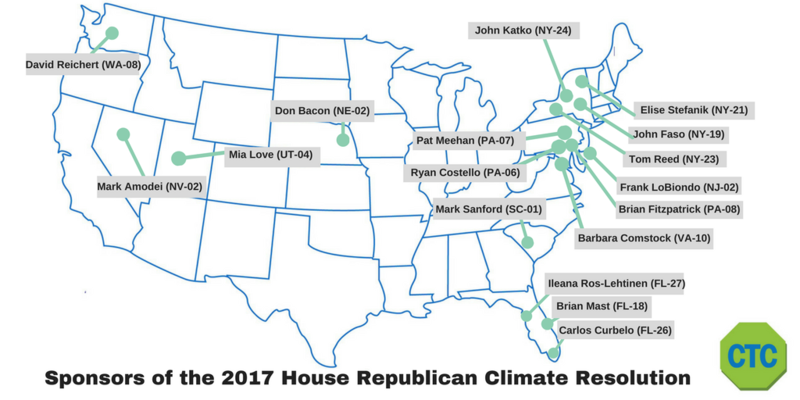 Map shows the 17 GOP House members who signed the March 2017 resolution discussed in text. Their ranks grew to 20 in May. Nevertheless, the resolution stands as a positive if halting step in the possible emergence of a critical mass of Republican officeholders to endorse and eventually vote for a carbon tax to combat climate change. Editorial endorsements of the CLC’s carbon tax proposal span a broad ideological range. Far and away the greatest attention-getting development in carbon taxes this year (2017) was the emergence of the Climate Leadership Council and its Feb. 2017 brief, The Conservative Case for Carbon Dividends. The paper was issued under the signatures of Republican icons James Baker and George Shultz, both of whom had served Republican presidents as secretaries of state and treasury and who personify an erstwhile (pre-Bush 43 as well as pre-Trump) Republican establishment. The carbon tax outlined in the council’s brief begins with a $40/ton CO2 fee, which would rise over time at an as-yet unspecified rate. One hundred percent of the carbon revenues would be returned to households as dividends, making the proposal the first Republican-branded carbon tax employing the dividend approach championed by the Citizens Climate Lobby, rather than dedicating the revenues to cutting corporate income taxes. CO2 reductions from CLC proposal will turn on escalation rate from initial $40/ton. Details about CLC’s proposal may be found on their site. CLC renewed its call for a $40/ton carbon fee “in exchange for a rollback of Obama-era climate rules” in a May 9 New York Times op-ed, The Business Care for the Paris Climate Accord, co-authored by Shultz and Halstead. A signal development since 2014 has been the emergence of the Niskanen Center as a leader in conservatives’ (and especially libertarians’) interest in carbon taxing. The center’s founder-director, Jerry Taylor, was an energy policy analyst at the Cato Institute, where he helped forge Cato’s unflinching climate denialism (“I used to write skeptic talking points for a living,” he said in an April 2017 interview) until an immersion in climate science led him to a change of heart and a 180-degree turnaround on climate. In March 2015, the Niskanen Center launched a full-scale assault on conservative obstruction of climate policy with a provocative paper by Taylor, The Conservative Case for a Carbon Tax. The paper argued that if conservative denial of climate science is grounded in ideological aversion to command-and-control regulation, as proposed in EPA’s proposed Clean Power Plan, conservatives should embrace and promote a revenue-neutral carbon tax as a more efficient, less burdensome, “free market” alternative and do so soon, because once established, EPA regulations will be almost impossible to uproot. [C]onservatives ought to abandon their “just say no” policy towards addressing climate change. Global warming is real, industrial emissions are the main cause, and warming imposes risk that warrant a policy response… [C]arbon taxes are a far more efficient means of controlling greenhouse gas emissions than command-and-control regulation. [A] carbon tax at the levels presently discussed in Washington would not unduly burden the economy, and that’s particularly true once we consider the (non-climate) environmental benefits that would follow from the tax as well as the benefits of any offsetting tax cuts. Taylor’s most recent (April 2017) paper, Debating Carbon Taxes With Oren Cass (And Bill Gates), is a lively and thoughtful survey of energy developments worldwide, particularly in the developing nations. In the lengthy (5,000 words) paper he tackles various precepts of conservative opposition to climate policy, e.g., unilateral U.S. action on climate is futile and self-defeating, and intentional abandonment of fossil fuels will consign poor nations and people to perpetual poverty. The paper is factual and filled with encouraging data on economic and technical progress in the solar and wind industries, and the clean-air co-benefits of phasing out coal, oil and gas. I know [passage of a carbon tax] seems improbable or even impossible. It looks impossible, but I think it’s going to go to the inevitable without ever passing through the probable. Conservatives need a solution which doesn’t grow government, which trusts in the power of accountable marketplaces to deliver innovation and which empowers individuals in the liberty of enlightened self-interest to make their own decisions. Eureka! Q: Isn’t a tax government intervention? Make a conservative case for a tax. A: There is a role for government. It is simply being the honest cop on the beat that says to all fuels that you have to “own your own costs” so that the market can judge your product. We should eliminate all the subsidies. No more Solyndras. No more production tax credits for wind. No more credits for electric vehicles. No more special tax provisions for oil and gas. Level the playing field. The big challenge is reaching fellow conservatives and convincing them that the biggest subsidy of all may be to belch and burn into the trash dump in the sky — for free. That lack of accountability may be the biggest subsidy of them all. Q: A lot of conservatives don’t accept climate change. Why do you? A: I do because there is every reason to celebrate the science. Science is the process of discovery of the intricacies of this glorious creation. Is science settled? No. Science is never settled and we will never know all of the glories of the creation. But what we are discovering in climate science is that there is a risk that we can avoid from the creative innovation that comes from free enterprise. We have a danger and an opportunity. As a conservative, I say what a great opportunity to create wealth, innovate and sell innovation around the world. Q: So why have conservatives rejected the science? A: It has been presented as doom-and-gloom, this apocalyptic vision. Denial is a pretty good coping mechanism. The second reason is the assumed solution is a bigger government that taxes more, regulates more and decreases liberty. Given that, conservatives doubt whether we have a problem. The Dallas Morning News piece has other revealing quotes as well. For more about Inglis, see The conservative case for a carbon tax (Houston Business Journal, 2/20/14), and Could Republicans ever support a carbon tax? Bob Inglis thinks so (Washington Post, 3/14/13). Secretary Shultz, who served Pres. Nixon as Secretary of Labor and Treasury and OMB Director, and Pres. Reagan as Secretary of State, is a vocal supporter of the fee-and-dividend approach to carbon taxing. In 2013, he and Nobel economics laureate Gary S. Becker published Why We Support a Carbon Tax in the Wall Street Journal. Their op-ed is a compelling and elegant articulation of the case for a revenue-neutral and steadily rising carbon tax. In October 2015, New York Times columnist Thomas Friedman contrasted Shultz’s climate concern to the denialism of leading GOP presidential hopefuls. An excerpt appears to the right. In July 2014, Shultz participated in an M.I.T. Climate Lab hour-long Webinar on carbon pricing and taxing, alongside former Reps. Bob Inglis (see above) and Phil Sharp (D-IN), president of Resources for the Future. In a bravura performance, Shultz articulated the rationales for a carbon tax (and against cap/trade), including cap/trade’s price volatility and vulnerability to market manipulation, a carbon tax’s straightforwardness, and the success (and revenue-neutrality) of British Columbia’s carbon tax, as well as the general power of pricing and the insurance value of a carbon tax. Audio of the Webinar is available via this link. 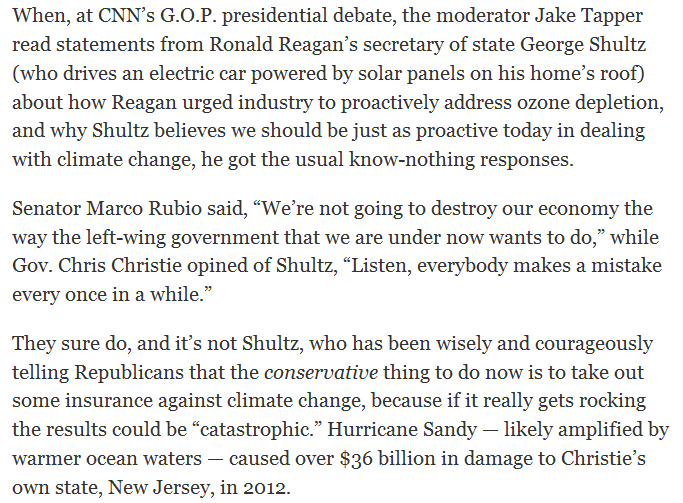 And in March 2015, Shultz penned “A Reagan approach to climate change” (Washington Post), reminding readers of President Reagan’s bold response to scientific alarm about thinning of the Earth’s ozone layer which led to the Montreal Protocol, a treaty phasing out ozone-depleting chemicals. Shultz urged leaders to follow Reagan’s example by setting aside doubts and taking out a climate insurance policy before we get “mugged by reality.” Shultz concluded that robust funding of clean energy research and development, plus a revenue-neutral carbon tax, “starting small and escalating to a significant level on a legislated schedule” would “do the trick” and are the kinds of policies Reagan would advocate to avert climate disaster. The one concept that all students, even those sleeping in the back of the lecture hall, learn from an introductory economics class is that prices matter… As prices increase, the quantity consumed goes down. So if fossil fuel combustion produces byproducts that cause negative health effects on third parties as well as changes in the temperature of the atmosphere, the obvious lesson from economics is to increase fossil fuel prices enough through taxation to account for these effects. Then firms and consumers will react to these prices in thousands of different ways, the net result of which is less aggregate fossil fuel combustion… [Yet] voters and their elected officials resist this simple insight and instead prefer to impose only energy efficiency standards on manufacturers of consumer appliances and automobiles. A singular emphasis on energy efficiency rather than prices has two important drawbacks. First, more efficient appliances and automobiles cost much more to achieve equivalent energy savings than a tax on fossil fuel consumption. This occurs because higher prices encourage all possible avenues of reducing energy consumption — which efficiency standards do not. Excerpted from “When Prices Are Wrong, Markets Don’t Work,” in NY Times, “Room for Debate,” The Siren Song of Energy Efficiency, March 19, 2012. A conservative carbon tax has three key components: revenue neutrality, elimination of existing taxes, and regulatory reform. When combined, these policies would yield a smaller, less powerful government; a tax code more conducive to investment and growth; and the emissions reductions the law says we must achieve … [R]eform must devote every dime of carbon-tax revenue to reducing other tax rates or abolishing other taxes altogether. Turning on one revenue stream while turning off others is how we prevent growth in government… [A] $20 per ton tax on carbon dioxide emissions could generate roughly $1.5 trillion in revenue over ten years. That’s enough to allow for the complete elimination of several levies that conservatives rightly regard as structurally deficient or duplicative: capital gains and dividends taxes, the death tax and tariffs. From How to Tax Carbon: Conservatives can fight climate change without growing government (American Conservative, 10/2/13). A straight-up, revenue-neutral carbon tax clearly is our first-best policy, rewarding an infinite and unpredictable variety of innovations by which humans would satisfy their energy needs while releasing less carbon into the atmosphere. Excerpted from “Birth of a Climate Mafia,” July 2, 2014 (which, apart from this excerpt, is unrelievedly anti-climate reform). Gregory Mankiw (Harvard): Perhaps the most widely-published advocate for higher fuel taxes in the economics profession is Gregory Mankiw, Harvard professor and former chair of the President’s Council of Economic Advisers (2003-2005), and former senior adviser to Republican presidential candidate Mitt Romney. Mankiw was one of the 32 signatories to the Carbon Tax Center’s November 2015 Call to Paris Climate Negotiators to Tax Carbon., as well as a signatory to the Climate Leadership Council’s Feb. 2017 brief, The Conservative Case for Carbon Dividends. I will tell the American people that a higher tax on gasoline is better at encouraging conservation than are heavy-handed CAFE regulations. It would not only encourage people to buy more fuel-efficient cars, but it would encourage them to drive less, such as by living closer to where they work. I will tell people that tolls are a good way to reduce traffic congestion — and with new technologies they are getting easier to collect. I will advocate a carbon tax as the best way to control global warming. I have a back-up plan for [Sen. McCain]: increase the gasoline tax. With Americans consuming about 140 billion gallons of gasoline a year, a gas-tax increase of about 40 cents a gallon could fund a corporate rate cut, fostering economic growth and reducing a variety of driving-related problems. Indeed, if we increased the tax on gasoline to the level that many experts consider optimal, we could raise enough revenue to eliminate the corporate income tax. And the price at the pump would still be far lower in the United States than in much of Europe. Tax Bads Rather Than Goods: A good rule of thumb is that when you tax something, you get less of it. That means that taxes on hard work, saving and entrepreneurial risk-taking impede these fundamental drivers of economic growth. The alternative is to tax those things we would like to get less of. Consider the tax on gasoline. Driving your car is associated with various adverse side effects, which economists call externalities. These include traffic congestion, accidents, local pollution and global climate change. If the tax on gasoline were higher, people would alter their behavior to drive less. They would be more likely to take public transportation, use car pools or live closer to work. The incentives they face when deciding how much to drive would more closely match the true social costs and benefits. Economists who have added up all the externalities associated with driving conclude that a tax exceeding $2 a gallon makes sense. That would provide substantial revenue that could be used to reduce other taxes. By taxing bad things more, we could tax good things less. Although this and some other pronouncements by Mankiw concern gasoline taxes rather than carbon taxes, they could be considered bold by a close adviser to the Romney for President campaign. Conservatives do not have to agree that humans are causing climate change to recognize a sensible energy solution. All we need to assume is that burning less fossil fuels would be a good thing. Based on the current scientific consensus and the potential environmental benefits, it’s prudent to do what we can to reduce global carbon emissions. When you add the national security concerns, reducing our reliance on fossil fuels becomes a no-brainer. Yet the costs of reducing carbon emissions are not trivial. Climate change may be a serious problem, but a higher overall tax rate would devastate the long-term growth of America and the world. It is essential, therefore, that any taxes on carbon emissions be accompanied by equal, pro-growth tax cuts. A carbon tax that isn’t accompanied by a reduction in other taxes is a nonstarter. Fiscal conservatives would gladly trade a carbon tax for a reduction in payroll or income taxes, but we can’t go along with an overall tax increase. Laffer has said little about carbon taxes since around 2012, however, so it’s not clear if he currently (2017) qualifies as a carbon tax supporter. Douglas Holtz-Eakin (American Action Forum): Holtz-Eakin, a senior policy adviser to the 2008 McCain campaign, is now president of the American Action Forum. In “Make a carbon tax part of reform effort” (Concord Monitor, 9/19/11), Holtz-Eakin argues for comprehensive tax reform to include a carbon tax so that more of the “true cost of burning a fossil fuel… in the form of air pollution, a negative impact on human health, harm to the environment or climate change [is a] component in economic decisions [such as] include whether to invest in a coal-fired power plant or a wind farm.” He suggests that carbon tax revenue be used to reduce the payroll tax, income tax and corporate tax rate. His organization, AAF, criticizes EPA regulation of greenhouse gases as costly and largely ineffective. A tax on carbon… would reduce the security threat posed by the increasing possibility that crude oil reserves will fall under the control of those who would do us harm, either by cutting off supplies, as happened when American policy towards Israel displeased the Arab world, or by using the proceeds of their oil sales to fund the spread of radical Islam and attacks by jihadists. A tax on carbon… need not swell the government’s coffers — if we pursue a second, long-held conservative objective: reducing the tax on work. It would be a relatively simple matter to arrange a dollar-for-dollar, simultaneous reduction in payroll taxes… Anyone interested in jobs, jobs, jobs should find this an attractive proposition, with growth-minded conservatives leading the applause. We have a unique opportunity to end the rancorous debate about climate change, a debate that is poisoning the air — the political air, that is — and inhibiting progress on two fronts: progress on addressing the possibility that we are on the road to a catastrophic warming of the globe, and progress on reforming our anti-growth tax structure, which is so inequitable that it is straining the public’s belief in the fairness of capitalism and what we like to call “the American Dream.” All we need do is stop pretending that the cost of carbon emissions is certainly zero, and that regulation provides a more efficient solution than the market. Stelzer urged the Republican leadership in Congress to integrate a carbon tax into broader tax reform. He also pointed out that World Trade Organization rules enable a U.S. carbon tax to form the template for an effective global carbon tax structure, thereby breaking the UN climate policy gridlock. This collection of 13 essays finally provides empirical data—numbers, if you are an ordinary reader rather than a policy wonk—and analyses to help us to some reasoned conclusions. The broad conclusions to be drawn are that a carbon tax would: reduce emissions, raise revenues more efficiently than the taxes it might replace, and be relatively easy to implement, “a straightforward application of basic tax principles,” in the words of the volume’s sponsors, the International Monetary Fund, the Brookings Institution, and Resources for the Future. Most recently, in A Deal Over Climate Change, also in the Weekly Standard, Stelzer opined that the Supreme Court’s 5-4 stay of the EPA Clean Power Plan could catalyze a bipartisan agreement to substitute a carbon tax for G.O.P. denialism and Democratic regulation. 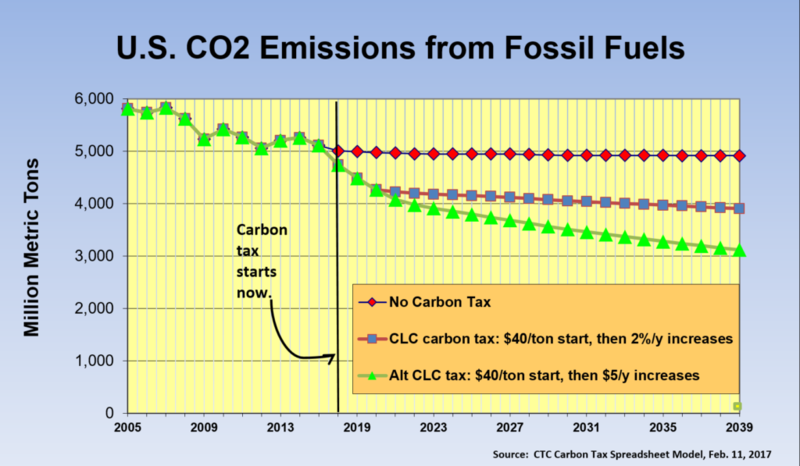 The Feb 2016 post’s subhead, “Why not a carbon tax? Both sides could do a lot worse,” encapsulated Stelzer’s belief that political forces would push the two sides toward such an accommodation. Alan Viard, Resident Scholar, American Enterprise Institute: Former Dallas Federal Reserve economist (1998-2006) and former senior economist on the President’s Council of Economic Advisers (2003-04), Alan Viard is a regular contributor to the tax policy journal “Tax Notes.” In testimony to the Senate Finance Committee (2009), Viard explained the perverse effects of giving free allowances to polluters under cap-and-trade. When Senator Kerry asserted that “caps” are necessary to reduce emissions because polluters would “just pay” a carbon tax, Viard patiently and eloquently explained the bedrock principles of price elasticity that undergird both carbon taxes and cap-and-trade systems. Viard concluded by recommending a carbon tax with revenue used to reduce marginal tax rates. Kevin Hassett, Director of Economic Policy Studies at the American Enterprise Institute: Conservative economist Kevin Hassett has long advocated a carbon tax as vastly preferable to costly regulations, subsidies or cap-and-trade schemes that induce energy price volatility and provide opportunities for manipulation and gaming by emissions traders. In early 2017, Hassett was named chair of President Trump’s Council of Economic Advisors. Along with AEI colleagues Steven Hayward and Kenneth P. Green, Hassett authored “Climate Change: Caps vs. Taxes” (2007), a short and very readable article that deftly and systematically demolished the myths surrounding cap-and-trade with offsets while sketching the structure of a simple, effective carbon tax “shift.” The authors pointed out that many of the supposed advantages of emissions caps were based on assumptions about the success of EPA’s SO2 emissions trading program for power plants which was orders of magnitude smaller and simpler than the market that would need to be established for CO2 emissions. They argued that much of the EPA program’s apparent success in reducing SO2 emissions from power plants was due to simultaneous railroad deregulation which reduced the cost of delivering low sulfur coal strip-mined in the west. And they cautioned that a CO2 cap-and-trade program would induce price volatility, feeding speculators while starving legitimate investors in alternative energy. The article neatly described the potential for a “double dividend” obtained by tax shifting: imposing taxes on CO2 pollution while using the revenue to reduce other distortionary taxes such as payroll, individual and corporate income taxes that dampen desirable economic activity. Hassett and colleagues suggested that such a carbon tax “shift” could improve the overall output of the economy even without considering climate benefits and thus represented a “no regrets” policy for conservatives who aren’t convinced of the danger of global warming. 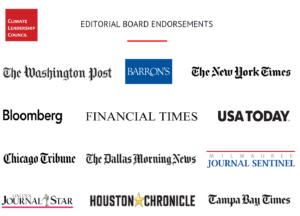 The article cited authoritative works by a range of leading economists including Yale’s William Nordhaus and Stanford’s Lawrence Goulder who also support carbon taxes.